Movie day started early with our busy bees arriving at Mall of Africa at 07:00, when some of the stores weren’t even open! Our busy bees are most certainly dedicated and super amped for the day. Have you ever rented out an entire cinema…??? Yes we were amazed at that as well. That’s what we did, well we had to for our 190 kids all coming to watch The Incredibles 2. The kids arrived super excited, we could hear them coming our way through the halls of the mall. Smiles, ear to ear and pure energy came our way. Kids were treated to breakfast in the morning at school before their road trip to Mall of Africa. Once the kids arrived we were happily painting faces of superheroes and animals. All the kids received their popcorn, juices and sweet and were escorted to their seats. The lights went out and the excitement rose in the air. It was incredible to see the kids’ reactions and the joy they exuded. With all the excitement, it left our tummies craving a good meal and that’s when all our kids received happy meals and goodie bags prepared with love from the Mimecast and Human Doings teams. Such a heartwarming experience, leaving us so much more grateful for being involved in such an impactful project. A huge thanks to Mimecast, SterKinekor and MacDonalds for making it all possible. Human Doings is astounded by the amount of hands always willing to help and will be eternally grateful. 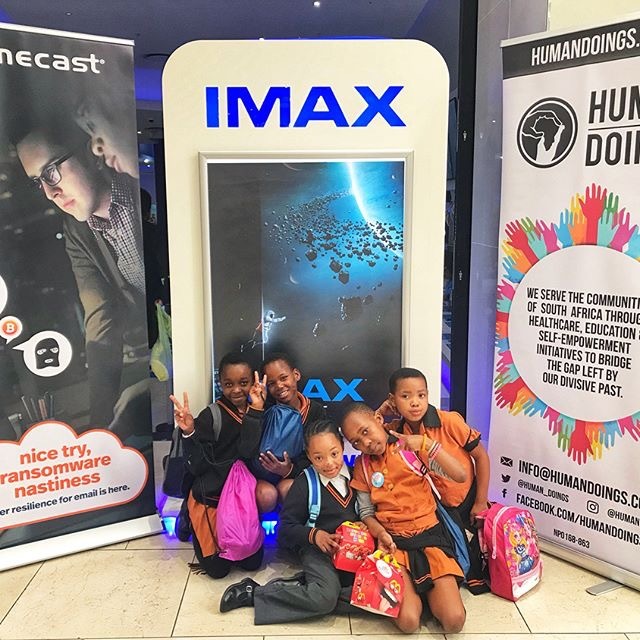 Human Doings, Mimecast, SterKinekor and MacDonalds hosted a special movoe day for 196 children.